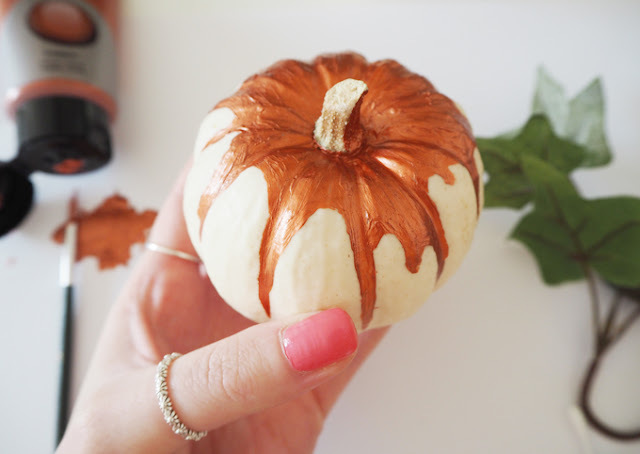 With October flying by already, I thought it was about time I got my Halloween DIY on! I have been pinning, searching and Instagram-stalking decorated pumpkins around this time each year but never got the chance to give it a go myself. 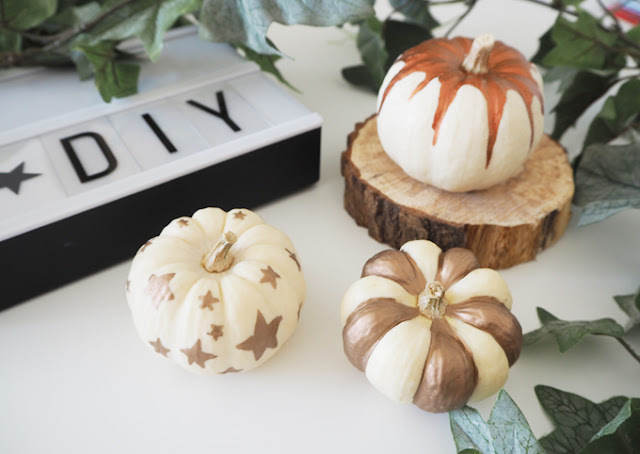 With buying my own house I feel I can go all out Halloween crazy this year, starting with these super easy DIY pumpkin decorations. 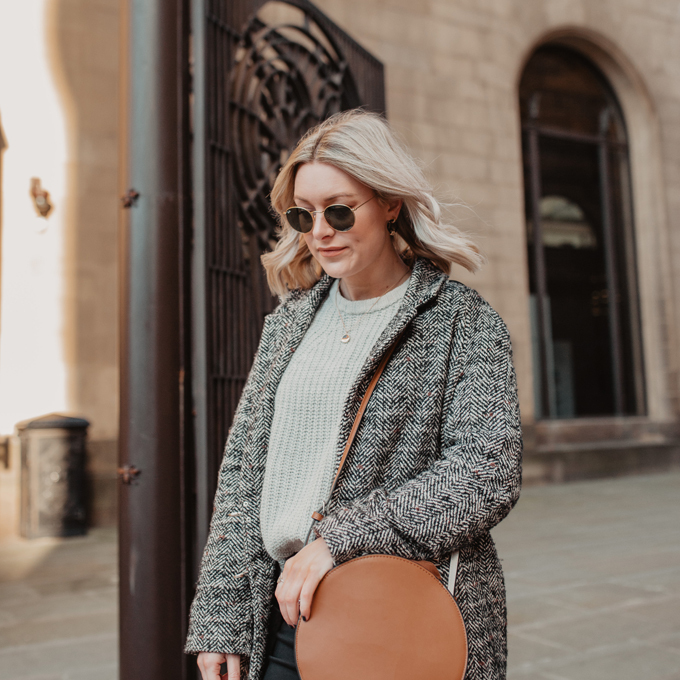 Metallic has been everywhere from interiors to fashion this year and is one of my favourite trends, so I thought it only fitting to add a little shine to these seasonal fruits with some bronze and copper. 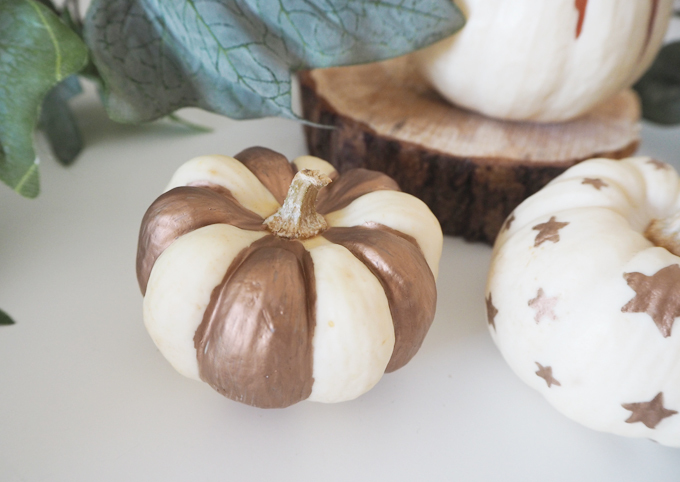 Read on to found out how I made my DIY metallic decorated pumpkins. 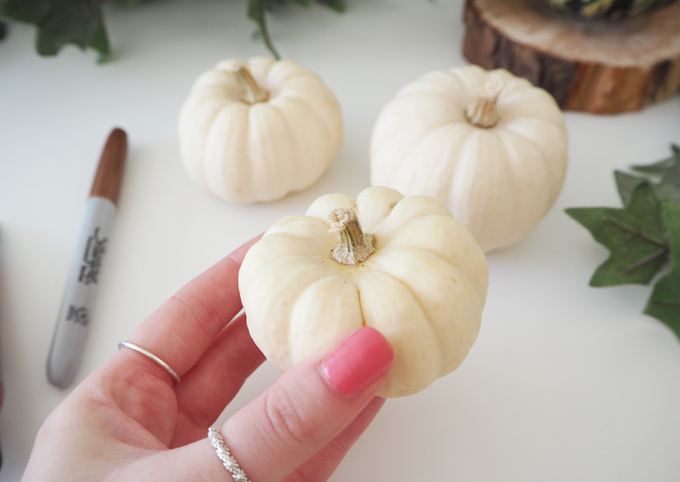 I searched around town for these little white pumpkins and finally found them at my local flower shop for £1.75 each, they are great because they are already a nice neutral colour, perfect for decorating. I gave them a little wipe with water to remove any dirt before getting to work. 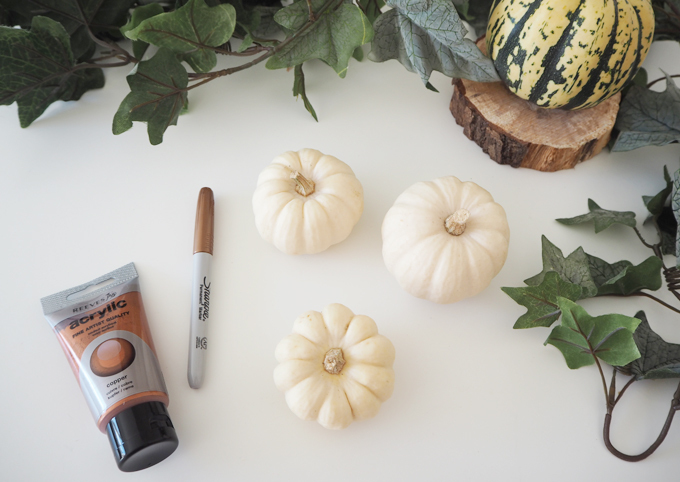 For the first two pumpkins, I bought a Sharpie Permanent Maker in a Bronze shade. I decided to pay tribute to the country how know how to do Halloween well, America with a stars and stripes theme. 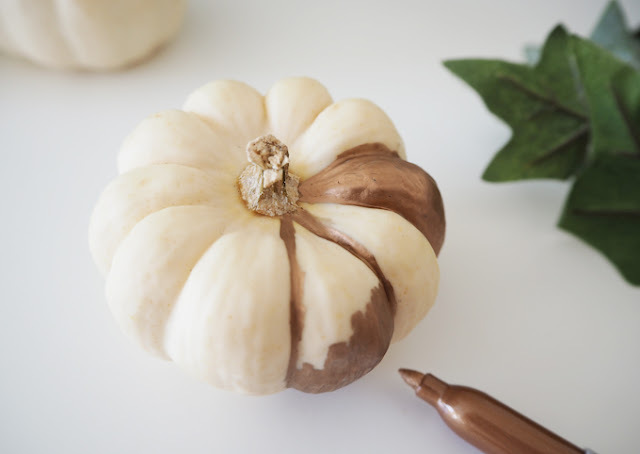 For the first pumpkin I started drawing a line starting from the top near the stalk and followed the natural grooves of the fruit down to the base to create an outline, before filling in one stripe. I then skipped the next ridge, leaving it blank before colouring in the next ridge. I continued around my pumpkin until there was an even number of blank verse coloured ridges and grooves. 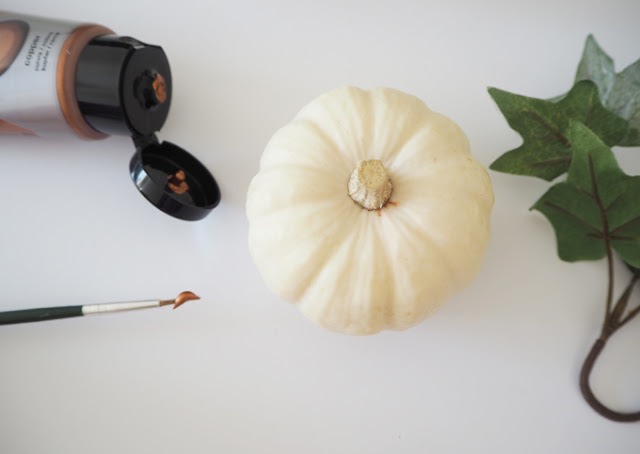 Top tip: If you make a mistake, grab a damp cotton bud and rub gently over the blob, but be quick as it is a permanent marker it dries very quickly. 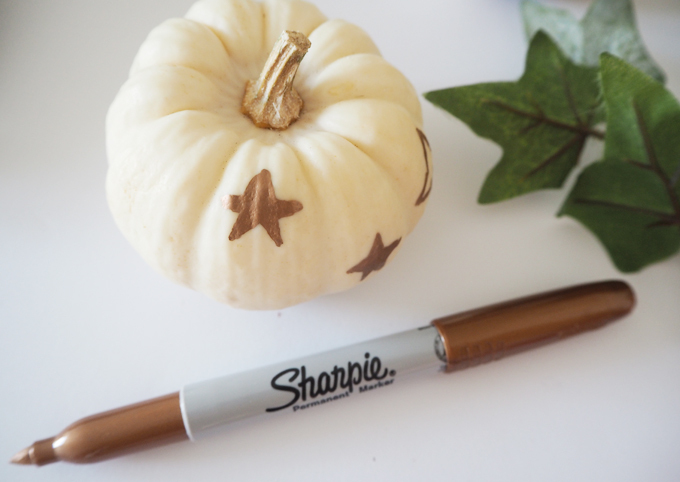 For the second pumpkin, I use the pen to draw a scattered star design all the way around. I alternated small and medium sized stars in a random order. 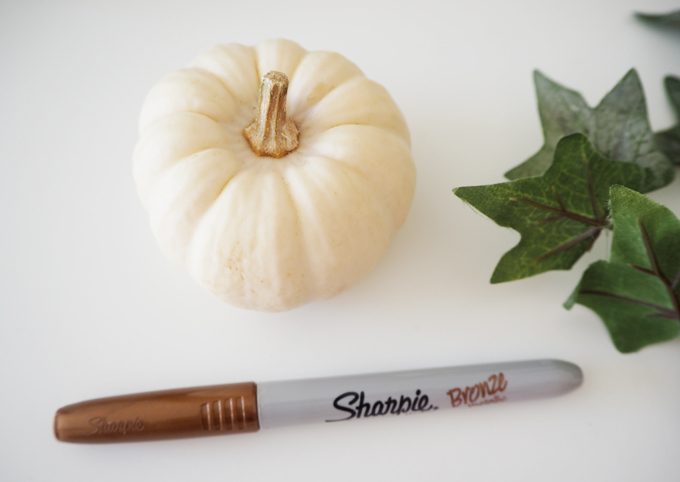 The pen dries really quickly, but to make sure I didn’t damage my table I placed a piece of paper underneath my pumpkins whilst drawing. An alternative to the Sharpie pen is painting your pumpkin using metallic acrylic which works just as well. 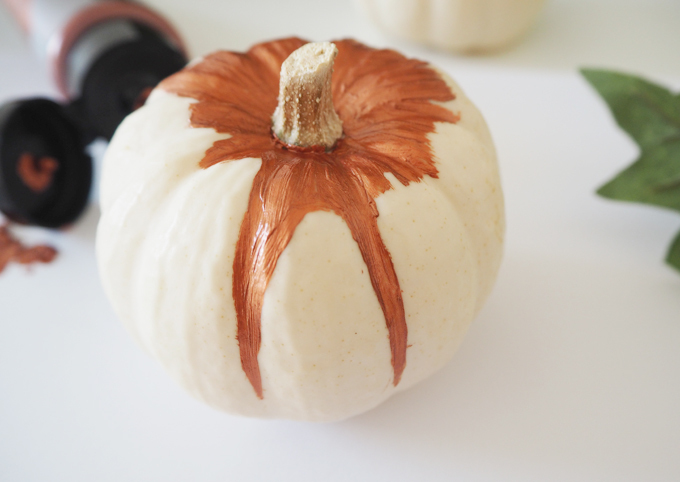 I used Reeves Acrylic in Copper and a thin, short brush to create a paint drip/melting wax effect on my last pumpkin. 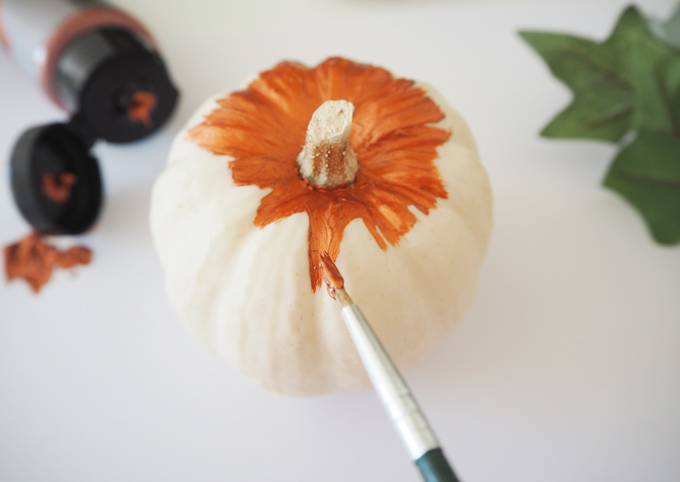 I started painting at the top of my pumpkin, filling in around the stalk and right up to the edge before dragging the brush strokes down the sides of the pumpkin following the natural dents in the fruit. I varied between long lines and shorter ones to give the illusion of dripping paint, with my longest one stopping just before the bottom. I found searching Pinterest for images of paint drips helped when doing this stage. 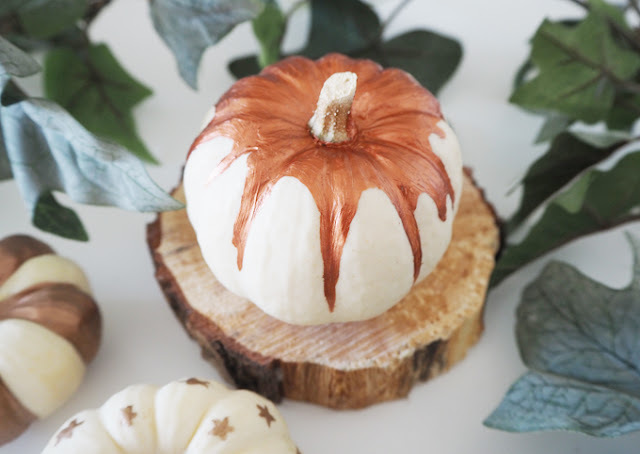 After I had worked my way around my pumpkin, I went back and tweaked any drips that were a little messy. The good thing about this one is you don’t need to be good at drawing or painting as you can just make it up as you go. It is also easier to correct any mistakes as the paint doesn’t dry as quickly as the permanent marker, so they can be wiped away. I then set it aside to allow to dry. 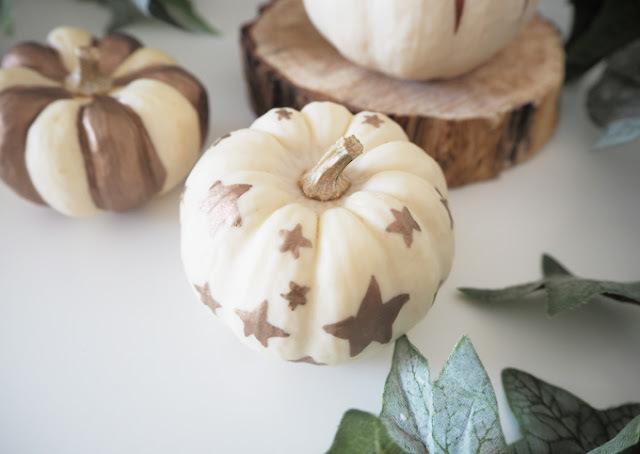 These little pumpkins are great for adding s festive feel to any room, place on your fireplace or dressing table in the weeks running up to everyone’s favourite holiday; Halloween! 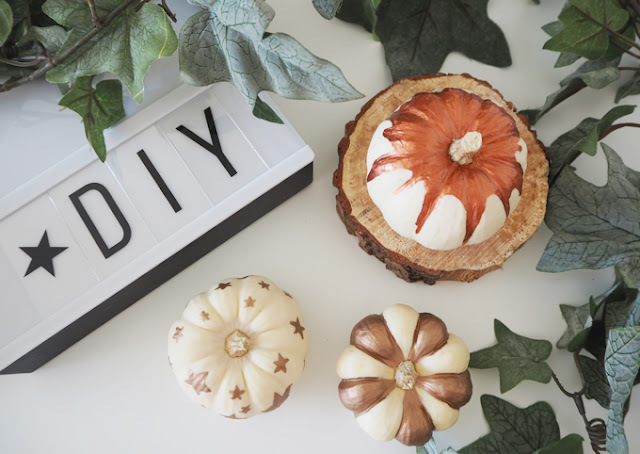 The good thing about this easy DIY is not only are they stylish and on trend but also less messy than craving your own pumpkin. Anyone can give it a go. I am going to display my pumpkins in the middle of my dining room table with some fake ivy, candles and wood blocks for a super autumnal center piece. 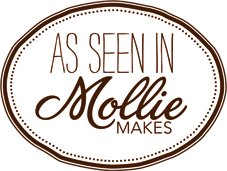 Look out for my next post for more photos and how I made my center piece if you want to be inspired to make your own.